Women need a place to come, relax, an enjoy a delicious lunch together. The "icing on the cake" is who these women are ... and the energy in the room that leaves you feeling empowered yourself. We laugh, learn, and enjoy our lunch together the 4th Thursday of each month at the Lubbock Club. Join us! Empowering Women is NOT a group you join! In fact, all you do is RSVP and show up. It's that easy. CLICK HERE to see who some of the speakers of the past. Click on button below to make your reservation for the next lunch. 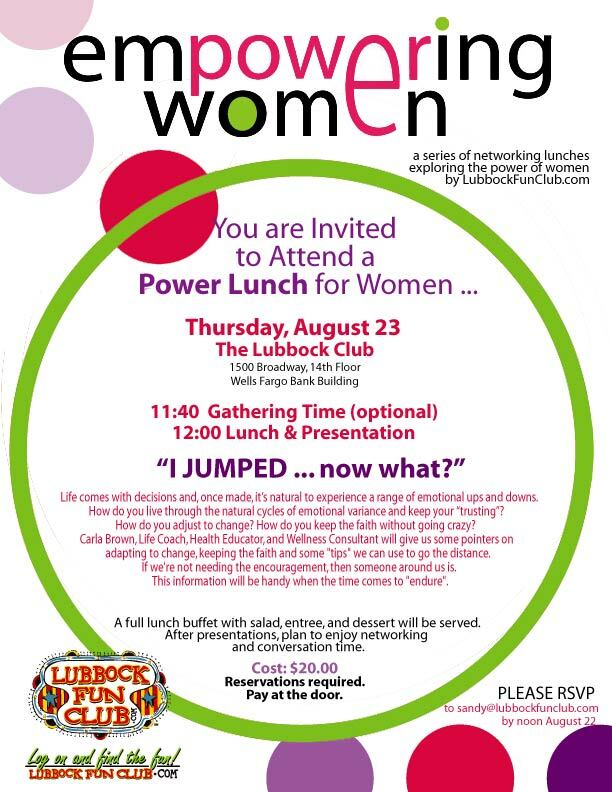 Empowering Women is a monthly lunch (planned for the 4th Thursday of each month) that provides a supportive time for women across Lubbock to come together, share their focus and influence, and network. It seems there is a great need for women to share this kind of time and mutual strength together and we are proud to provide that for our community. FEEL FREE TO FORWARD THIS PAGE to another woman you know and pass that along, post it on your billboard, send it out to invite clients, etc. click on UPDATE YOUR SETTINGS at the bottom. Make sure you have "selected" WOMENS ISSUES in your Fun Club VIP Profile. What If you don't get a Thursday "Fun Club Postcard"? Click here and JOIN our free subscription. Be sure and select "WOMENS ISSUES"
so you will be notified when something good is going on. and send email to include your name, company, phone number, and total number of attendees including you plus any quests. All reservations that are not cancelled by the Wednesday noon deadline and all "no shows" will be invoiced.